On this date in 1986 President Ronald Reagan presented a radio address to the nation. 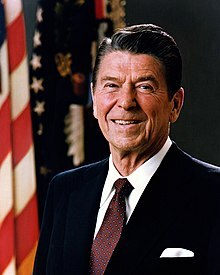 His subject was a political scandal called the Iran-Contra Affair, where members of Reagan’s administration engaged in a secret arms deal in an attempt to obtain the release of American hostages. Without approval or even the knowledge of the U.S. Congress, Reagan administration officials sold weapons to Iran and then used the profits from the sale to fund rebel forces in Nicaragua. I realize you must be disappointed and probably confused with all the furor of the last couple of weeks. You must be asking: What were we doing in the Middle East? What was our policy? Where was it wrong? Were we engaged in some kind of shenanigans that blew up in our face? I can understand if these are the questions you’re asking, and I’d like to provide some answers. For most writers, understanding the difference between active and passive voice has nothing to do with political rhetoric. Instead the difference relates to making sure that your sentences are as clear, concise and active as possible.